Inside, the 2016 Hyundai Tucson offers one of the most comfortable vehicles on the market. Both rows are adult-friendly, so everyone has plenty of room to spread out during long rides. High-quality materials, like leather upholstery, give you the luxury treatment. Fold down the rear seats to create a max cargo hold of 61.9 cubic feet. The Forester isn't far behind. Like the Tucson, it's known for its impressive passenger space. The cabin also sports a clean-cut, handsome design. When you fold down the rear seats, you can create up to 74.7 cubic feet of cargo space. We like the Subaru Forester's central Starlink infotainment system. Its voice-control technology lets you access apps without looking away from the road. Connect it to your smartphone to stream endless entertainment options. The 2016 Hyundai Tucson proved difficult to beat. Its central touchscreen is responsive and easy to use. Bluetooth connectivity means you can make hands-free calls and stream music from devices. Heated and ventilated front seats treat you to complete comfort, all year round. Both models offer impressive safety gear, but the 2016 Hyundai Tucson really shines. High-tech gadgets help you avoid danger. The forward collision mitigation system, for example, detects an oncoming crash and automatically applies the brakes to help you come to a quick stop. The Forester comes with its own safety perks, including a rearview camera. Use it to spot any obstacles in your path as you back out of the driveway. The Forester's EyeSight camera system even offers a bird's-eye view as you pull into parallel parking spaces. Once again, the 2016 Hyundai Tucson comes out on top. It earns up to 26 city/33 highway mpg, so you can save a bundle at the pump. You can also expect a smooth, refined ride and plenty of pickup whenever you need it. 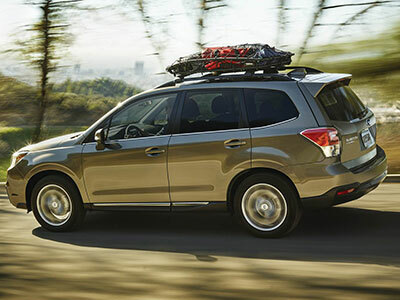 With 24/32 mpg, the Forester may not save you as much money at the pump, but it's still pretty impressive. The Forester also offers one of the quickest rides in the segment, getting you up to speed in a snap. These crossovers have much to recommend them, but the 2016 Hyundai Tucson comes out on top. We like its rich interior passenger space and family-friendly infotainment options. 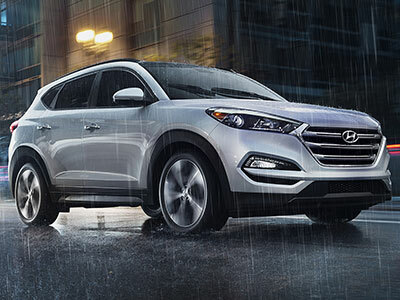 As you cruise the highway, the Tucson's safety gear gives you plenty of peace of mind. Under the hood, engine options combine substantial power with premium fuel economy. Feel the power of the Tucson on a test drive today!